Panasonic KX-TDA600 adalah IP sangat dapat diandalkan aktif cerdas solusi komunikasi untuk bisnis Mid-size. Modular dan scalable dalam arsitektur – sistem ini dirancang untuk memenuhi semua kebutuhan komunikasi perusahaan bisnis Anda. Investasi dalam sistem telekomunikasi membutuhkan kejelian komunikasi bisnis. Bisnis harus mampu untuk berkomunikasi secara efektif hari ini – namun ingin memastikan bahwa mereka benar dilengkapi untuk menangani tuntutan pertumbuhan kebutuhan komunikasi masa depan mereka. Dikemas dengan repertoar solusi teleponi canggih, solusi IP-aktif KX-TDA600 komunikasi membawa berbagai manfaat untuk membantu mengatasi kebutuhan komunikasi perusahaan Anda. Solusi – seperti Mobilitas Wireless memungkinkan perusahaan untuk memungkinkan karyawan kebebasan untuk berkeliaran tanpa perlu khawatir hilang panggilan penting dari pelanggan potensial, sedangkan solusi Pesan suara dengan mudah dapat meningkatkan layanan pelanggan dan memperluas bisnis Anda jam operasional. Easy to use navigation keys allow fast, one touch access to multiple phone system functions. The ergonomically designed navigation keys make it highly intuitive to go through phone system feature menus. One-touch function access programmable keys save time and effort. These keys can be used to store telephone numbers, or access frequently used phone system features. The dual colour Red/Green LEDs give visual indication of accessed feature status as well as the status of colleagues (Idle, Busy). The IP and digital telephones have multiple points of adjustment for maximum visibility at any angle. Optional Bluetooth module for the KX-DT346 and KX-DT343 digital telephones as well as the KX-NT300 series IP telephones provide wireless headset support. In addition, the built-in headset jack, with headset (optional), allows busy users to keep their hands free while taking important telephone calls, giving users the freedom and flexibility to work on PC or take notes. The NT300 Series IP terminals connect directly into your data network, and provides IP-Telephony features with enhanced levels of functionality and comfort. Users can easily connect their PCs and laptops to the company Local Area Network (LAN) using the built-in 2-Port Ethernet switch on the back of the IP telephones – reducing desktop cable clutter. Developed specifically to meet the needs of businesses of all types, the Panasonic digital telephones incorporate sleek design, improved ergonomics, flexibility and enterprise-voice quality. The KX-TDA600 supports the newly released KX-NT300 Series IP telephones that are stylish, intuitive, user friendly and comfortable to use. The NT300 series IP telephones take you to a new dimension in communications productivity, broadband network connectivity and customer care. The sleek, ultra-modern design, available in both black and white works well with any work environment and office decor. Have an important customer call and need to walk away from your desk? Panasonic Wireless Mobility Solution is here to help. Panasonic KX-TDA600 IP-enabled system lets you simply continue your current conversation over a lightweight, business-smart wireless DECT telephone while you are away from your desk or moving around the office. Mobile telephones can also be integrated as office extensions – using just one number – for anytime anywhere connectivity. The system allows you to set your wireless DECT telephones to have the same extension as your desk phone, allowing you to receive calls even when away from the desk. You are always there, ready to receive your customers’ calls and make the most of every business opportunity that comes along. And now with standard, business or tough-type IP54 compliant DECT that is able to handle harsh environments – you can be rest assured that no matter what you need – with Panasonic; you have the DECT mobility solution of your choice. Mobile Telephones are a compelling way for doing business outside of the office. The KX-TDA600 system supports the latest Mobile Telephone integration technology – enabling calls directed to an office extension to be redirected to the Mobile telephone through the TDA system at a lower, fixed cost. Once answered on the mobile, a user can easily transfer calls back to an office extension or even redirect a call to the office Voice Mail system. Mobile telephones can be integrated providing simultaneously ringing of both desk and mobile phone when a call comes in, allowing users to pick-up their calls on either their Desk phone or Mobile phone providing greater flexibility. Enjoy superb mobility whatever your business demands. Whether you work in an office, a factory, a warehouse, a supermarket, or other large facilities – the Panasonic Multi-Cell DECT system keeps you in constant touch with work colleagues and customers even when you are untethered and moving within your work environment – giving you freedom to roam. The IP-enabled KX-TDA600 system allows wireless communication over an extended range by using cell stations that boost the flexibility and mobility of your wireless handsets. Both standard and High Density cell stations are available providing automatic hand-over – enhancing coverage and giving you true communication mobility even within large premises. Supporting industry Standard CTI interfaces – Panasonic IP-enabled KX-TDA600 platform supports a large number of software applications ranging from standard “Screen Pops” to desktop Customer Relationship Management (CRM) systems and many more – all designed to enhance employee efficiency and improve business productivity. 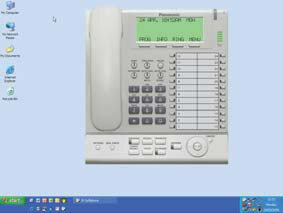 Incoming call display (Screen Pop), Busy caller display, Dial from MS Outlook, Call accounting etc – for Typical Office Use. PC Console provides company operators and receptionists with a powerful tool for improving call-handling and customer service. PC Console displays information about caller on the operators PC screen even before taking the call – making it easier for operators to prioritise incoming calls, so important customers are never kept waiting. Operators can quickly see which extensions are busy and which are free, and can transfer calls and perform other duties using simple drag-and-drop and point-and-click operations. Businesses using the IP-enabled KX-TDA600 system can leverage highly intuitive PC based software applications to simplify and enhance real-time communications for business telephony users. 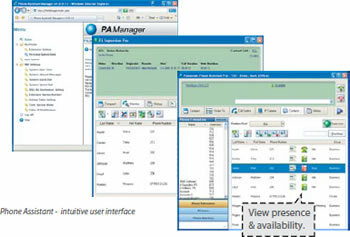 The Panasonic Phone Assistant productivity software suite is a highly intuitive PC based application suite that blends powerful point and click telephony together with screen based presence, availability, integration with Microsoft Outlook®, integration with popular TAPI enabled CRM desktop tools(e.g. ACT, Goldmine, TwixTel), and a variety of collaboration tools to simplify and enhance real-time communications for business telephony users. All applications – when used together can significantly enhance business productivity and help propel your company to the next level. The Panasonic KX-NCS810X IP Softphone allows road warriors, sales and support staff, or any other power user to use their computer as an IP Phone for access to anytime, anywhere business IP telephony. The user simply needs to connect to the corporate IP network over a managed broadband connection to enable the IP Softphone. All employees can now be centrally connected – providing simple yet highly cost effective VoIP communication. Advanced voice messaging applications and voice guidance provides a user friendly interface that can simplify and streamline business communications by efficiently routing customer calls to the proper department or agents. Further, voice mail storage facility can be used for graceful offline call handling during busy hours – increasing overall productivity and providing better customer service. SVM Mode: For Simple Voice Mail only features. MSG Mode: For DISA functionality leveraging Outgoing Message recordings. The MSG mode can also support mobile telephone extension integration allowing for mobile telephones to be used as PBX extensions. SVM + MSG Mode: Allowing customers to have both a simple voice mail as well as DISA functionality. Companies can even upload from PC high-quality sound files (8kHz, 16 bit .wav file) that can be played as OGM recordings – for various outgoing message applications. Companies requiring enhanced voice messaging capabilities beyond the functions found on the optional ESVM cards can upgrade to the external KX-TVM50 or KX-TVM200 messaging solutions providing enhanced message applications and customer service. These external optional voice processing systems come fully packed with business class voice messaging features, designed to help businesses handle every call in a courteous and efficient manner. With the KX-TVM50 and KX-TVM200 – Panasonic delivers new levels of communication ease and efficiency that can help any business achieve higher productivity. If a call is not answered, or processed gracefully – it reflects badly on your business. That is why the Panasonic KX-TDA600 system is integrated with multiple call handling features as standard. Messaging features offer greater flexibility to businesses. If short of staff, you can handle calls with Automated Attendant Service. By combining the system with a Panasonic Voice Mail System, you can upgrade to Unified Messaging: combining e-mail and voice mail, and giving you multi-media communication capabilities. You can even customise the system to meet the needs of different callers and get additional features that are available only from Panasonic, such as Live Call Screening, Two-Way Recording and Two-Way Transfer. Mobile phone extension support and many more. Using the advanced TVM Messaging solution – each extension can be assigned its own personal mailbox that can be contacted any time of day or night. If a caller leaves a voice message for a user, the extension user is notified by a message-waiting lamp available on proprietary telephones or can be additionally notified via an e-mail with the voice message attached. Incoming call information is also recorded with the message and is displayed on a Proprietary telephone. This includes Caller’s telephone number, time of call, and length of call. If a call cannot be answered it can be sent to a call queue and greeted with a friendly welcoming message. The messages are pre-recorded and can inform the caller that their call will be handled in the order it has been received by an agent as soon as one becomes available, or the messages can be used as a way to generate additional business opportunities by alerting the caller of a service the company offers, or a forthcoming sales promotion. For networked multi-site deployments – centralised voice mail is possible for up to 8 networked KX-TDA600 systems. Extension users from each branch site can set their phone terminals to forward calls when in busy or no-answer state to the central voice messaging system and access messages using VM access codes. Corporate IP Network infrastructures can now carry both voice along with data. Designed to support Convergence via modular architecture, the IP-enabled KX-TDA600 communication system allows an easy migration towards Voice over Internet Protocol (VoIP), allowing voice and data communication to work within the same network – increasing network utilisation and providing improved return on investment for infrastructure and cabling cost. Benefit from communications over a common infrastructure – including hardware and software – that extends the power of applications to users, local or remote. Blending IP Telephony with existing traditional digital technology, providing flexible and cost-effective options for preserving your existing infrastructure, while delivering remote worker connectivity. Partners offering solutions can supply customers with an end to end solution, covering switches, routers and advice on cost effective office set up. 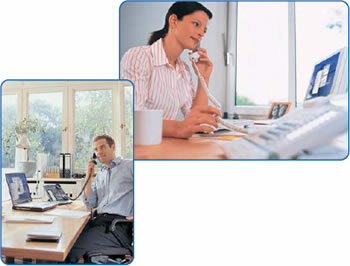 Connect remote offices to your Company headquarters; providing centralised call handling, & lower network call costs. Gain the same advantages as larger competitors, by extending network services to small home/office workers, while simplifying installation costs, and telephone extension configurations. Through easy-to-use, intuitive management tools, providing lower cost centralised management capabilities. With a KX-TDA600 system, installers and administrators can remotely manage any deployment scenario – whether a stand-alone system or a networked multi-site system connected via an IP network. All they need is a networked PC with the necessary PC Maintenance Console application and they can access and administer systems from any location reducing extra administration overhead and resulting in quick system handling. Multi-site networking helps companies with multiple branch sites to benefit from lower costs for branch-to-branch communication by either leveraging ISDN network connectivity, corporate Wide-Area-Networks (WANs), or using Managed VPN services available from network service providers. Supporting the industry standard QSIG protocol, the KX-TDA600 system allows you to interconnect multiple PBX locations to help modularly build a large, effectively seamless, virtual telephone system. The system supports QSIG over both ISDN as well as VoIP (H.323) giving businesses access to more advanced networking features like direct extension to extension dialling, CID of PSTN calls and ICD group call handling across the QSIG network. For companies with large legacy PBX in the Head-office, customers can add the KX-TDA600 system as the new advanced company communication system while still maintaining links back to the main legacy PBX via QSIG connection. Network Busy Lamp Field (Network – BLF) or Network Direct Station Selection (NDSS), allows unique extensions across networked KX-TDA600 systems to be monitored by a single centralised Network Operator. These extensions can be part of a global QSIG network connected over both ISDN or Voice-over-IP (H.323). If any of the pre-programmed extensions are busy, receiving an incoming call (ringing) or in ‘Do not Disturb’ (DND) mode, the programmed DSS key for that extension will illuminate, showing the operator the status of that particular extension providing instant – across the network status visibility. Incoming Call Distribution (ICD) groups can be set-up across multiple networked TDA PBX systems. Extensions can be grouped together from different PBX systems, creating globally diverse departments with the same ICD group number – e.g. in distributed call centres. Simultaneous or delayed ringing can be programmed for all Network ICD (NICD) groups for efficient call handling. For the majority of businesses, personal contact with the customer is a significant factor for success. The telephone system is at the heart of all communications – without any concern as to how the communication is conveyed: via IP, by traditional telephony or by employing wireless technology. What is crucial for businesses is quality and reliability. Panasonic provides applications and solutions that address all these crucial business needs. The Hospitality market requires the communications system to be flexible, economical, and easy to use, with maximum reliability and adaptability for the individual needs. The possibility of PC integration to allow guest room billing and system management has also become a requirement of this sector. The Panasonic KX-TDA600 system is perfectly equipped with all the necessary hospitality features and solutions. To be able to work effectively and comfortably in a medical environment, it is necessary that the communication platform has high level of reliability and can adapt perfectly to fit the needs of the health industry. With safe wireless mobility, advanced call distribution and flexible CTI – the KX-TDA600 system provides an effective solution and allows easy integration with life saving technologies. In today’s competitive world, personal contact becomes ever more important to the customer. Customer satisfaction, flexibility and accessibility provide the crucial lead in this sector. With solutions such as CRM integration with desktop applications, everything that you need is already built in to the systems as standard. The legal industry of law firms, notaries, attorneys and solicitors etc have specific requirements when it comes to business communication. Attorney client conversation may need to be recorded – or clients may need to be billed for calls. Law firms may prefer to have secure entrances monitored via IP cameras. The Panasonic KX-TDA600 system address all these unique communication needs of the legal industry – in a cost effective way. Public administrators see themselves today more than ever as service providers. Their services must be carried out inspite of the increasing pressure of cost management for government, council and municipal authorities. The KX-TDA600 system offers such establishments of unified communications solutions that can help maintain and keep their costs in check. High flexibility, economy and reliability as well as adjustment to individual needs are important criteria, which communication platforms must fulfil. The Panasonic KX-TDA600 system outshines here as it was developed with manufacturing plants and production departments in mind. Experience a new dimension of efficient communications with KX-TDA600s future ready solution. Customers like to only invest in well built products, displaying them attractively and placing them within their work environment. These same guidelines should also be followed by your telecommunication systems. When it comes from Panasonic – you are sure that all these important points have been meticulously followed – so customers can be proud to own a Panasonic system. Logistics requires smooth and reliable transport of information. This is why logistics companies have particular requirements when it comes to communication systems. With possibility for integration into CRM solutions and mobile accessibility, the KX-TDA600 system can become the driving force for your businesses.